Born December 1, 1895, at Torbrook Mines, Nova Scotia. Edwin was a good student. 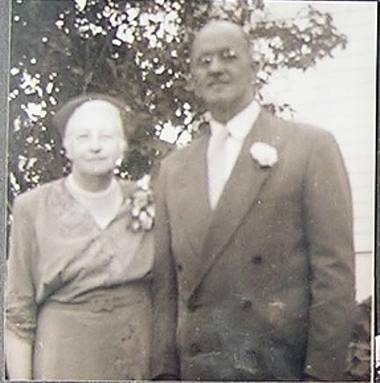 Married after World War I.
Buryl was from Londonderry, Nova Scotia, and came to Torbrook Mines to visit her older sister, Annie Maud Banks. Edwin worked many years for the Canadian National Railways, starting as a switchman and advancing to be Passenger Equipment Supervisor. He was an alderman on the city council in St. Boniface for many years, and later became mayor. He was a member of the legislature in Manitoba for several years, and, at one point, was the leader of the CCF Party in Manitoba. He was an honorary life member of his Masonic Lodge, president of the Norwood Canadian Legion, president of the Norwood Speed Skating Club, and on the board of St. Boniface Hospital. He was also an elder of the United Church. He volunteered and was part of the first contingent of Canadians to go to Britain in World War I. He was one of the Canadians who held the line during the first gas attack by the Germans. He was badly wounded in the thigh and lay in the trenches without water or food for 72 hours before he was found. What saved his life was rain that fell. When the Germans passed by, he pretended he was dead. He was found in a pool of blood. His rescuers couldn't believe he was from the battalion that had pulled out two days before. He spent the rest of his life in and out of the hospital, because of the leg wound that plagued him and also because of ulcers caused by being in the gas attack. The leg was nearly amputated, and one of the reasons it was not was because the doctors tried a new drug, sulpha, and it cleared up the infection. Later, they used penicillin. Kay vividly remembers her dad reading the dictionary to improve his grade 8 vocabulary. He was always doing for others and felt a strong compassion for the underdog. His children had a great affection and admiration for him. Buryl was a big asset to Edwin politically, putting on teas and receptions in their home prior to elections. Kay said her mom was a very dear, gentle lady who seemed to collect anyone who needed a friend. Their house was always open, and their dinner table full. Buryl was an accomplished musician and was the organist at her church. The family had a piano in their home and often, on a Sunday, had a sing-song. Kay also remembers how they loved Uncle Ralph's visits. He and Edwin would sit at the table long after dinner and relive their youth. With Uncle Cecil, it was a reminiscing of the war years. Buryl's mother lived with them and was much loved. Margaret Eileen Hansford (b. April 19, 1923). Thelma Hansford (b. April 7, 1925; d. 5016). Robert Harold Hansford (b. August 16, 1926; d.October 10, 1981). Barbara Kay Hansford (b. June 28, 1933). Shirley Ethel Hansford (b. January 1, 1935). Albert George ("Ab") Hansford (b. March 25, 1936).